Warm, shallow seas covered New Jersey during Cambrian time. Quartzite (metamorphosed sandstone) and thick limestone deposits typify the rocks found in outcrops of this time and indicate a quiet geologic time interval for this part of the North American continent. Fossils, including the trilobite Olenellus, vertical worm burrows (Skolithos), and stromatolites attest to the marine origin of the Cambrian formations of northwestern New Jersey. North American Paleogeography: Fossil evidence tells us that Laurentia was centered on the Equator and rotated so that in present-day terms, Canada was east, instead of north, of the United States. 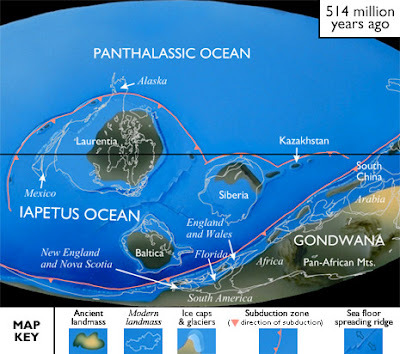 As with most of the continents, the majority of North America was underwater throughout the Cambrian Period. 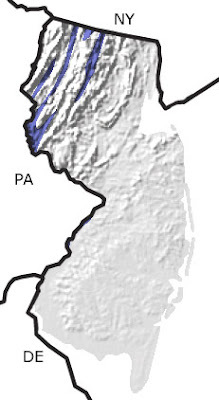 Small landmasses in the central part of the continent shed sediment in this shallow sea. Farther out, away from this influx of sediment, shallow water lime stones were deposited in a broad arc stretching from present-day Maine south to Texas and up to the Canadian Rockies. Beyond this region, deeper water deposits accumulated.